Full length protein corresponding to Goat IgG. This antibody was isolated by affinity chromatography using antigen coupled to agarose beads. Our Abpromise guarantee covers the use of ab150129 in the following tested applications. ICC/IF image of ab7291 stained HeLa cells. The cells were 100% methanol fixed (5 min), permeabilized with 0.1% Triton X-100 for 5 minutes and then incubated in 1%BSA / 0.3M glycine in 0.1% PBS-Tween for 1h to block non-specific protein-protein interactions. The cells were then incubated with the antibody (ab7291, 1µg/ml) overnight at +4°C. Ab98800, goat anti-mouse IgG, was then added as a secondary bridging antibody, at 1/250 dilution for 1h. 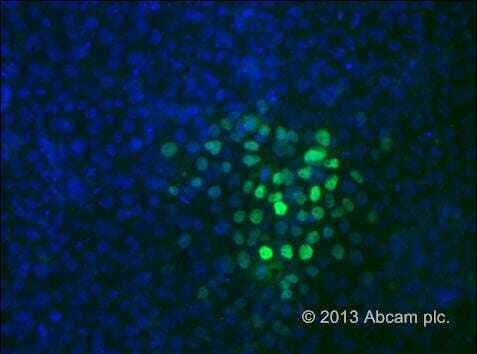 Ab150129 Alexa Fluor® 488 donkey anti-goat IgG (H+L) (shown in green) was then used at 1µg/ml for 1h as a tertiary antibody. DAPI was used to stain the cell nuclei (blue) at a concentration of 1.43µM. Overlay histogram showing Jurkat cells stained Goat polyclonal to Ikaros (red line). The cells were fixed with 80% methanol (5 min) and then permeabilized with 0.1% PBS-Tween for 20 min. The cells were then incubated in 1x PBS / 10% normal donkey serum / 0.3M glycine to block non-specific protein-protein interactions followed by the antibody (Goat polyclonal to Ikaros, 0.1μg/1x106 cells) for 30 min at 22°C. 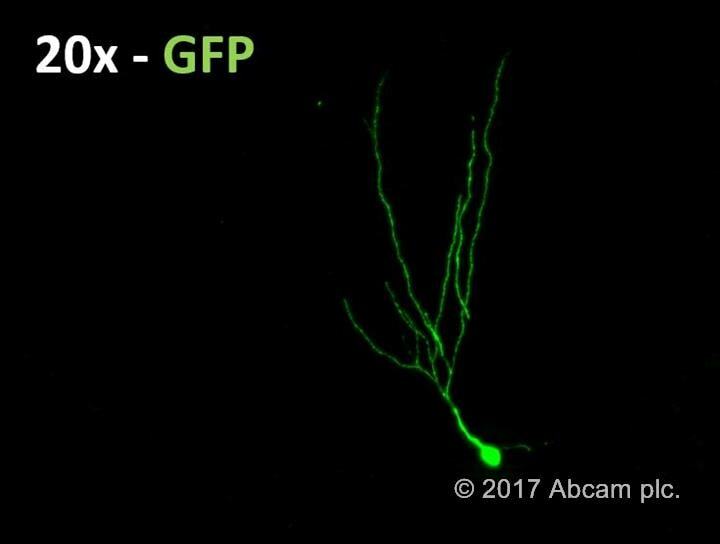 The secondary antibody used was Alexa Fluor® 488 donkey anti-goat IgG (H&L) (ab150129) at 1/4000 dilution for 30 min at 22°C. Isotype control antibody (black line) was goat IgG (polyclonal) (ab37373, 0.1μg/1x106 cells) used under the same conditions. Unlabelled sample (blue line) was also used as a control. Acquisition of >5,000 events were collected using a 20mW Argon ion laser (488nm) and 525/30 bandpass filter. Publishing research using ab150129? Please let us know so that we can cite the reference in this datasheet. This antibody was used to study the TIMP1-expression in human skin tissue (melanoma vs nevus) by indirect immunfluorescence. The anti goat antibody gives very specific and strong signals on frozen-tissue sections with no background. Publishable results. I want to use your ab150114 and ab150129 to do co-localization test. But I notice that the emission wavelength of these two antibodies overlap quite a lot. Will that affect my result? At the beginning I want to buy Alexa 488 and Alexa 594 to do the experiment, but the problem is our lab don't have the lsm which can detect Alexa 594 (the machine only has laser 405, 488 and 543, and I find the ex of Alexa 594 is 615nm). Could you give me any suggestions? I want to know whether it will work if I am going to buy Alex 488 and 555. For excitation with the 543nm laser, Alexa Fluor 568 is a better choice than 555 for combination with AF488. There is still some emission spillover but it is much less than for the 488/555 combination, and you should be able to set compensation without as much trouble. If the 488 signal is expected to be much brighter than the other, for instance if that protein is much more abundant than the other, then spillover may still be an issue. For an anti-mouse IgG secondary, I suggest ab175473. I am getting significant signal with this antibody diluted 1:1000 in mouse 3T3L1 (preadipocytes) without the addition of any primary antibody. I fix these cells in 4% PFA for 15 minutes and wash 3Xs 10 minutes. Further, I have blocked using 5% donkey serum with 1% BSA, 10% donkey serum, and 10% horse serum for 1 hour at room temperature all with similar results. Any other suggestions? Brachyury expression in spontaneously differentiated human iPS cells. 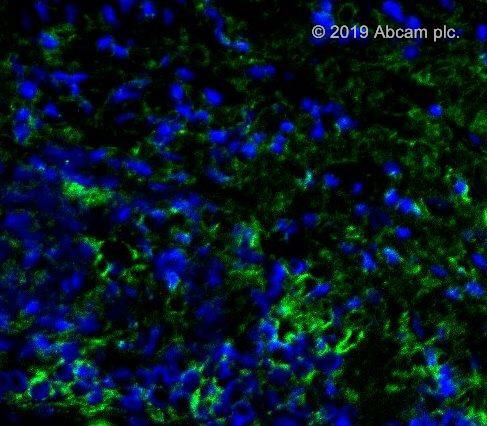 Following fixation in 4% PFA, the cells were assessed for Brachyury (T) expression using 1:100 dilution of the primary antibody in 1% serum, 0.1% triton, 0.1% BSA in PBS, followed by detection using donkey polyclonal rabbit IgG Alexa 488 (ab150129) at 1:500. The results show that nuclear T (green) was clearly observed. An isotype control IgG was run in parallel and showed no positive staining (not shown here). All nuclei were counterstained using DAPI (blue).